A charity for relatives of murder victims is seeking the appointment of a press ombudsman to help families thrust into the media spotlight. More sensitivity needs to be shown by news outlets to people caught up in tragedy, according to Support after Murder and Manslaughter (Samm NI). The group represents ninety families, but the findings are based on responses from families of ten victims. However, a former senior NUJ official said the report was misguided. Kevin Cooper, who represented the National Union of Journalists for 20 years, said: "The overwhelming number of journalists have done a difficult job in difficult circumstances." "They have attempted to tell difficult stories in a way that informed the public about difficult issues such as bereavement, murder, manslaughter." Samm NI's report forms the basis of their submission to the ongoing Leveson Inquiry into media practices and is the result of research commissioned from the University of Ulster. A spokesman for the University said: "This small-scale piece of research was concerned only with the experiences of the ten families interviewed and did not address the issue of whether NI needs a press ombudsman." "That matter was not within the remit of the research and is an issue on which the University does not take a view." Samm NI's volunteer co-ordinator and chair, Pam Surphlis, whose father Rev Eric Davidson and sister Judith were found murdered in his Cookstown home in 1992, said she wanted journalists to show more humanity in their dealings with victims. "The people I represent never wanted to be in the media, but were thrust there because a loved one has been killed," she said. "They are in shock, some are deeply traumatised, none has experience of dealing with the press. "All we are asking is for some sensitivity, a recognition that journalists can add to the pain and suffering of victims if they go about their business in the wrong way." 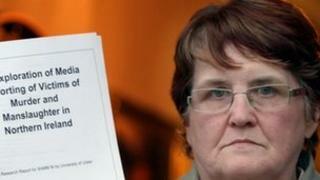 Mrs Surphlis said a local ombudsman would give families "great comfort". "Information on handling the media and how to complain should be included in the bereavement guide given to all families after a murder," she said. "The ombudsman could also ensure ethics are included in journalism training, and that journalists are offered and avail of on-going refresher courses." Samm NI's research focused on two key areas: the relationship between newspaper journalists and victims' families; and the impact of media reporting on family members bereaved through murder and manslaughter. The report concluded that the nature of the relationship was often highly negative, with family members recording the impression of journalists as persistent, deceptive, ruthless, and insensitive. Many family members said they felt used, powerless, and on occasion besieged or neglected. Samm NI said the PCC had moved to issue new guidance since the research was conducted, but the charity insisted further work was required to address the key issues of consent, permission and respect.